Much like the demand for groundbreaking technology, the demand for game-changing education has experienced a meteoric rise in recent years. High schools have had to evolve considerably in order to keep up with this demand— or, in the case of Archbishop Wood High School, outpace it. Archbishop Wood’s mission statement— “enabling all students to be productive, responsible Christians in a technologically complex, rapidly changing world”—is as true now as it was 53 years ago, when the school first opened its doors. Of course, technology has taken leaps and bounds since then, and the world itself has become a much different place, but what hasn’t changed is Archbishop Wood’s commitment to preparing students so they can navigate the world once their time at the schools has reached its end. We spoke with Harkins to learn more about not only the role of technology in education, but also the school’s highly adaptable academic curriculum and plans for the future. I understand you’ve implemented a number of significant new initiatives, including the Medical Careers Academy and the addition of a STEM program. Why these two programs specifically? We started the Medical Careers Academy as a way to not necessarily simply send doctors out into the world but to help provide career discernment. If you have a group of students in the room interested in a medical career, they might say they want to be a pediatrician or a respiratory therapist or a physical therapist. But suppose one’s gifts and skills would be as a respiratory therapist and they never had the chance to experience that because they thought they wanted to do something else? The goal of the Medical Careers Academy is to expose students to as many different medical careers as possible. Regarding the STEM (science, technology, engineering, mathematics) program, we put a concentration on engineering because, statistically, engineering jobs are in demand and pay well. A student might claim that they want to major in engineering, but if they don’t know what type of engineering, they won’t know what appropriate colleges to apply to. Ninety-eight percent of our students do go on to college and have an exceptionally high completion rate within the first six years after high school, and I believe our guidance department and our programs do a great job of preparing them and finding them the right school. Our students are getting tremendous career discernment. Archbishop Wood started a dualenrollment program with Bucks County Community College a few years ago. How has the partnership influenced the curriculum? We’re very fortunate for our dual enrollment with Bucks County Community College, and it is what our Medical Careers Academy is connected to. Our students can take a number of introductory classes, including Intro to Criminal Justice, Intro to Marketing and Intro to Education. In the medical field, we have Medical Terminology, Nutrition and Interpersonal Communications. These offerings tie back to career discernment as well, which we’ve really homed in on—a student might say they want to major in criminal justice, but why? And if so, do they want to be a police officer or an attorney? Before you make that commitment, both academically and financially, these intro courses allow students to discover a little more about what they’re going to do in a particular field and discover what they want to do. Looking forward, how will Archbishop Wood continue to add richness and diversity to the academic curriculum? As we’re planning for the future, we are going to be incorporating more programs that reflect our mission statement. For example, next year we will be implementing an honors academy, with a tagline of “learn today, lead tomorrow.” The program is being designed to instill a love of learning in students and teach them how they can take learning beyond the classroom walls. What we’re looking for is a small group of motivated and aggressive students who are looking for a program with an emphasis on experiential learning and project based learning that will take them beyond the walls of Archbishop Wood High School. We want to encourage both service and academic trips, and utilize the culturally abundant Philadelphia area to get students out of the building and using the local area and beyond as their classrooms. For our medical careers program, we’re incorporating a medical math class and a medical and professional Spanish class, so students can understand math as it relates to medicine and are able to speak a second language in a field that needs it. The cross-curricular writing program— which began this year—will allow students to learn how to write papers consistently across all departments, while addressing proper citation formatting and plagiarism concerns. Lastly, we will be adding a fouryear art program and a four-year music program to our curriculum next year. Art as a major was something for only juniors and seniors originally. We have a wonderful art department where the kinds find a lot of success winning contests and receiving great scholarships. We just realized we had things that needed to be expanded on in order to provide students with the whole picture. Technology is rapidly changing. How does Archbishop Wood keep up with these changes? Not only do we have courses such as our virtual business course, our multimedia course and our web-design course, but we have also recently invested in a couple of online resource programs such as EBSCOhost and Newsela, which provide digital resources and current news articles and periodical articles, all accessible from the students’ computers at home and cellphones, if need be. We’re trying to teach students to be responsible consumers of the digital world. 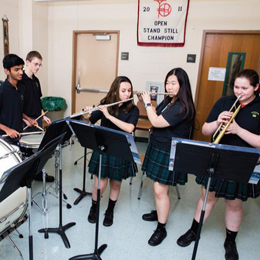 As principal of Archbishop Wood, how do you believe these academic initiatives— both current and future— ultimately make the school stand apart from the crowd? We’re consistently looking at what serves our students and what is best for them, so if we see a particular class or program not working, we won’t keep using it; instead, we will replace it with one that’s more responsive of today’s needs. We’re also looking for the trickledown effect—meaning, if a student sees the classroom across the hall doing something that appears interesting, the student in turn will find it interesting and want to do the same. This type of learning generates collaborative problem solving and critical thinking, and these are skills needed to succeed in the future. We will always attempt to stay ahead of the curve in what’s happening today and what’s needed for the future, but most importantly, encourage students to pursue their dreams … and we’re good at encouraging those dreams. 655 York Road | Warminster, Pa.